Byzantine-Romanesque architecture, is one of the most imposing buildings in Newark. One of the greatest buildings in Newark, and perhaps even all of New Jersey, is the magnificent First Baptist Peddie Memorial Church, a rock for all ages. Located on Broad Street just north of Military Park, it offers a commanding view of Newark's main thoroughfare as well as of Central Avenue. This elaborate Byzantine-Romanesque edifice also bears a Richardsonian influence. As an anchor on Broad Street, it has been described in overall setting as not 'totally unlike that of St. Basil's (cathedral) in Moscow, at the head of Red Square.' Unquestionably it is a church of national significance because of its robust treatment of the architectural style in which it is crafted. The First Baptist Peddie Memorial is not only architecturally unusual, it also occupies an important position in the history of Newark churches in general, and the Baptist Church in particular. Its congregation was created through mergers over a period of many years, the oldest dating to the church's foundation in 1801. The name Peddie Memorial came about Feb. 19, 1891, through an endowment made by Thomas Baldwin Peddie's widow. Recently, while sitting in a fast-food restaurant opposite Peddie Church, I couldn't help but stare at the architectural details of the building, which most of us have taken for granted for a century. Three Norman-style towers, massive granite walls, domed central auditorium, colonnaded front and side entrances, irregularly placed windows and the mysterious half-hidden faces embedded in the Celtic-like cornices all add to the intrigue as well as the magnificence of this exotic structure. As I sat eating my tuna hoagie, I couldn't help but wonder who designed, built and supported this wonderful Broad Street temple dedicated to the worship of God. The fortune that made the building of this showcase church possible was amassed by Thomas Baldwin Peddie, a native of Edinburgh, Scotland. Like so many other Newarkers of Scottish origin in the 19th century, Peddie came here because Newark was truly a place to make a fortune. Born poor in 1808, Peddie made Newark his home in 1833, three years before the City of Newark was carved out of the old township. At first, Peddie worked for the firm of Smith and Wright. Within two years he left and established his own company in the basement of 355 Broad St. He soon formed a partnership with John Morrison in manufacturing trunks, valises and carpet bags. By the 1850s, 150 men were employed at their business at 104 Market St., producing $180,000 worth of trunks. In 1861, Morrison died. Peddie continued the business, and it continued to expand until 1874, when G.B. Jenkinson and R. Dod helped Peddie form a new company. Together they established a two-story factory more than 400 feet long that generated an annual product worth $875,000, an enormous sum at the time. The company lasted until 1900, closing shortly after Peddie's death. Thomas Peddie was distinguished from his successful counterparts in manufacturing and commerce by two characteristics: his deeply commitment to the local Baptist Church and his generosity in supporting the construction of the great building that bears his name. The fabulous-fronted church was designed by a young Newarker, William Halsey Wood, whose career was cut short by his untimely death at 42 from tuberculosis. Wood trained briefly with a Newark architectural firm. At 24, he opened his own office. Wood's work habits were erratic and moody. Those who knew him well said he loved to play the organ in his studio during his working hours, which seemed to fuel periods of great creativity. That seemed to work, for his list of clients included Andrew Carnegie, Thomas Edison and Spencer Trask, president of the Clark Thread Co. Wood also designed the great Clark Mansion on Mt. Prospect Avenue for another successful Newark business leader of Scottish heritage. And he submitted architectural plans for 'Jerusalem the Golden, Scheme for the New York Cathedral of St. John the Divine.' Wood was a member of a group of high church Episcopal or Anglo-Catholic architects whose famous exponents in America were Richard Upjohn and Ralph Cram. Although Wood was always submitting plans for great church buildings such as St. John the Divine and libraries like the Allegheny and Carnegie, his smaller churches such as All Angels in Anniston, Ala., St. Paul's in Chattanooga, Tenn., and Christ Church on Bloomfield Avenue in nearby Bloomfield, which continue to bear his Anglo-Catholic imprint, brought him the most fame. One of his most interesting local structures was ‘Winmarleigh’ in North Newark, a rambling half-timber country house considered a precursor of Frank Lloyd Wright's Taliesin. Wood's mixed reviews in national architectural journals indicate his importance in the profession. One said, 'He must remain a puzzling figure….Even if his work is often aesthetically bad, it could sometimes be very good.' On balance, he failed to be an outstanding figure in America's architectural history, but he failed rather grandly. What he did achieve as an artist merits our interest and our respect nevertheless. The walls and towers of the First Baptist Church were contracted for on April 28, 1888. 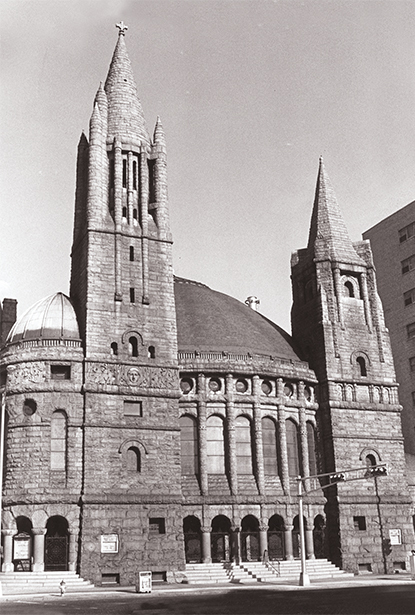 The building was dedicated on May 11, 1890, and its name changed to the First Baptist Peddie Memorial Church on February 18, 1891, in honor of its benefactor. Over the years the building has remained basically unaltered with the exception of a new roof. Its location on Broad Street north of Military Park and stance at the foot of Central Avenue is impressive, to say the least. The exterior's rugged, rough-hewn light Rhode Island granite was originally described as pink. Its nine polished columns were carved in Petershead, Scotland. Each is topped with a capital that has been described as Egyptian or Byzantine. Sculpted gargoyles and unadorned heads are carved along the exterior walls, and the doors and archways are decorated with 'lacy metal grillwork gates' – serving as much for decoration as protection. The building's footprint on Broad Street is 107 feet, and that on Fulton Street is exactly 100 feet. Two hundred doors pierce the structure, and 173 windows illuminate its interior. While the exterior walls of the building are extraordinary, its interior is nothing short of magical. Basically, Peddie Church is designed as an old-fashioned Baptist meetinghouse complete with the traditional baptismal pool. Any further resemblance to a typical church ends there. The curved dome and interior walls are of fine stone and elaborate brickwork, and the balcony is nearly circular, with the same feeling as St. Mark's of Venice. The Historic American Bui1dings Survey reports: 'We have an upper level pulpit or lectern. Above (behind) the pulpit enclosing the baptismal pool and below it on the main floor are convex-curved seats for deacons and clergy of (cushioned) pink marble, with arched columned semi-domed niches which again echo the entrance arcade and perhaps, the prototype of Pisa Baptistery.' The great domed effect of the sanctuary gives the feeling of being in the middle of an 80-foot circle or floating sphere. Behind the pulpit are a series of movable doors similar to an old-fashioned rolltop desk, where a series of small rooms were used for Sunday school or by the choir. Imagine the theatrical possibilities of using these spaces for multi-level presentations of a great oratorio, or in a theatrical performance. There were no chandeliers or gas brackets in the church to obscure the view, but 'around every one of the arches in the main auditorium ran a silver bronze gas pipe conforming in its shape to the lines of the arch and being pierced with a number of gas jets. These pipes were held up by griffins and constitute the whole lighting apparatus of the church.' In all, there are 600 burners in the church. The effect when these were lighted was very beautiful, for they were arranged so as not only to flood the whole edifice with light, but to bring out all the architectural beauties of the building. Of course the lighting has been modernized, and the original gas is no longer in use. Other areas of the sanctuary are lighted by chandeliers above the arches, and the bright light then travels to the gallery below. The Broad Street front of the church is lighted by three large bronze lanterns supported by griffiins. The first church organ was built in 1889. It consisted of two divisions 80 feet apart with pipe flanking either side of the front of the sanctuary. The original instrument included 64 stops and contained 4,181 pipes, 25 chimes and four manuals. The second organ, installed in 1968, included 3,000 pipes, 43 stops, 25 chimes and three manuals. The church's stained glass windows are of exceptional note, too. Those with geometric patterns are reputed to be Tiffany. The large windows in the Fish Alcove were dedicated in memory of the early clergy and church leaders. The 196-year-old congregation that worships at Peddie is Newark's third-oldest. It is affiliated with the American Baptist Churches, U.S.A. According to the Rev. Glenn Hatfield, the current pastor, 'Our church was in decline for many years; now we are growing again. What distinguishes our church is an international membership from 21 nations, friendliness, vigorous support for mission and ministry, our beautiful bui1ding and our location four buildings north of the New Jersey Performing Arts Center.' From the top of Peddie's tallest tower, to the dramatic curve of its balcony, from its polished interior stonework and exterior granite walls, the building exudes an architectural excitement and style unique to the city and the state -a treasure to be cherished and revered.